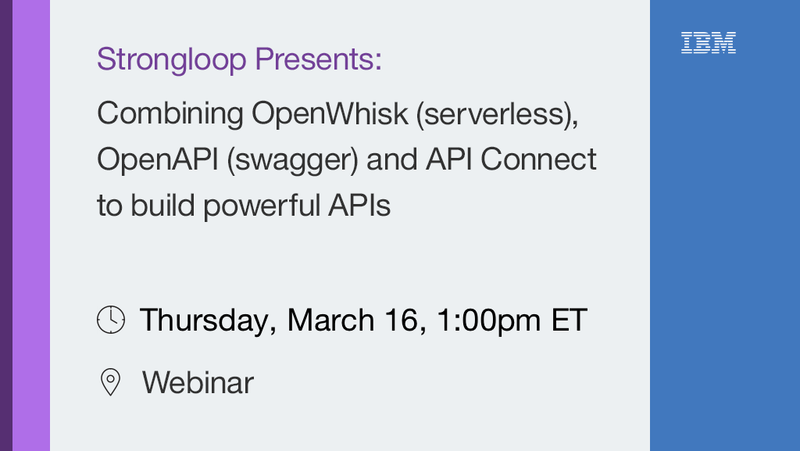 Our next webinar will be held on March 16th, focusing on “Combining OpenWhisk (serverless), OpenAPI (swagger) and API Connect to build powerful APIs”. Using the power and simplicity of serverless functions and exposing them via API Connect provides a clean and organized way to build powerful APIs, applications and integrations for your developer and your customers. We will go over both technologies, as well as OpenAPI, to see how the magic comes together. 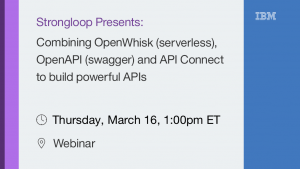 Joe Sepi (Lead Developer Evangelist, IBM Cloud) is the webinar speaker and will demonstrate how to use LoopBack to help you build APIs to take advantage of the search capabilities of Elasticsearch. Listen to the webcast recording now!